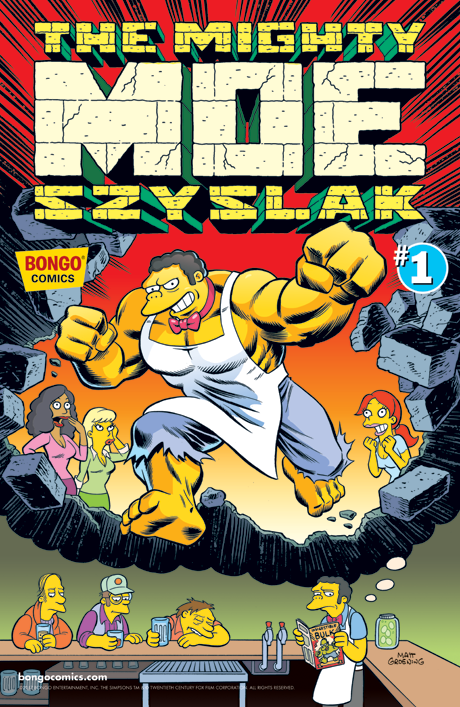 The Mighty Moe Szyslak #1 is an issue in the Simpson Comics One-Shot Wonders series. It was released at Simpsons Store released on June 22, 2017. 2.1 Moe-Brother, Where Art Thou? "Springfield’s belligerent bartender takes his best shot at a one-shot! First, Moe and Barney go on an excellent time-traveling adventure in search of love…and beer! Then, Moe goes in search of his long-lost, evil twin brother. And Moe waxes nostalgic over his lucky bar rag. All this and more." Main article: Moe-Brother, Where Art Thou? Modified on August 5, 2017, at 12:34.